Bondi Beach is the most famous surf beach in Australia and home of Australia's first surf lifesaving club 100 years ago. Bondi beach's low-rise holiday accommodation is the epitome of Australian beach culture. Bondi Beach's broad white sand beach on a sweeping bay with good surf, white sand and lots of restaurants just to sit and people watch. Many international tourists come to Bondi Beach to see the famous Australian icon. 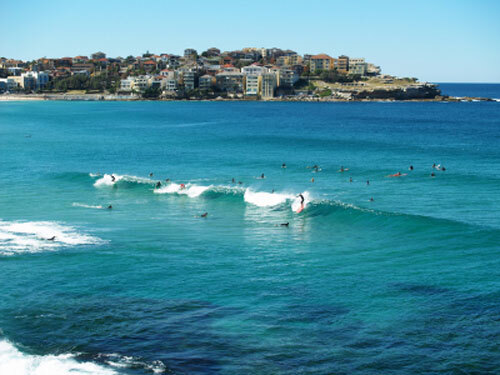 It's a must-see surf beach on any trip to big, bustling Sydney, Australia's biggest city. On a hot summer's day, it's so busy at Bondi that it seems like half the population of Sydney is at Bondi Beach. And no wonder too - Bondi Beach is near accommodation in Sydney's centre - only 20 minutes from the centre of Sydney and famous landmarks nearby including the Sydney Opera House, the Sydney Harbour Bridge, the historic Rocks area and Circular Quay. And there's a great choice of restaurants and cafes on the elevated strip behind the beach that are perfect for people watching. You might even spot Nicole Kidman or Elle McPherson in summer, coming home to Sydney with Bondi an irresistible attraction. It's also a wonderful Aussie experience to buy an ice cream on the beach strip on a hot summer day and take a stroll checking out all the beachgoers and their colourful ways. Going to Bondi Beach is a true Australian pilgrimage and well worth it, stretching over six months through summer if you're in Sydney. 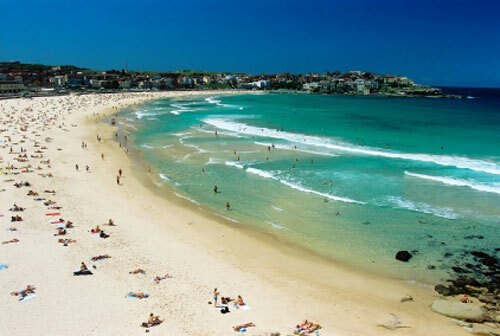 Other beaches near Bondi Beach are Joanh's Beach, Tamarama (known as Glamorama to locals), Manly Beach to the north, and "Coogee Beach" and "Cronulla Beach" to the south. You can take the famous Manly ferry from Circular Quay near the Sydney Opera House, across Sydney Harbour to Manly, where it's a quick walk over the hill to Manly beach. Sydney Harbour is what makes Australia's biggest city unique - with multi-million dollar mansions and easy access across the beautiful harbour to beaches like Manly. It's often joked that Bondi Beach is New Zealand's third largest city with all of the Kiwi immigrants who've found accommodation near Bondi Beach. The sand at Bondi Beach is good by world standards, but if you want white sand like you'll find in the Maldives or Tahiti, travel 2 hours south of Sydney to a place called Hyams Beach, where your feet will squeak as you walk on the beautiful white beach sand. And back on Bondi Beach, it's the overall experience that makes this one of the world's best beach holidays. Accommodation near the beach is plentiful, beach cafes and shops are everywhere, and the crowds at Bondi Beach are always colourful. videography by editor's brother in-law.